Postally Used Dashnak Stamps? Mission Almost Impossible. Over the past twenty years, I have handled thousands of Dashnak stamps - and maybe six commercial or philatelic covers and cards, which can only be obtained as expensive single item Lots in auction. At one point, it occurred to me to look at my stamps and take out any that looked postally used as opposed to Cancelled to Order (Favour cancelled). CTO stamps normally have neat, full cancels "socked on the nose" or they have neat quarter cancels. Only four places seem to have cancelled to order: Alexandropol, Erivan [ maybe 90% of the total], Elenovka and Katarsky Zavod (the copper mines at Giryusy). The last two places favour cancelled only a tiny number of stamps. Most CTO stamps will have gum but, of course, this can be washed off and sometimes is. From my stocks, I picked out maybe thirty stamps. A few were on pieces and one had a violet Censor cachet across it. These I sold. The rest are shown above. Given the Tariffs at this period, you would expect to find mainly rouble value stamps or stamps with rouble surcharges. However, early on there was a 60 kopeck tariff and a 1 rouble 20 tariff. Since there is no 60 kopeck Imperial stamp, then a 50 Kopeck + 10 kopeck would have been an efficient two stamp way of reaching 60 kopecks [ 25 + 35 is also possible but no other combination]. For 1 rouble 20, 1 rouble + 20 kopeck is one of two ways of obtaining that rate; the other is to use two 1 kopeck stamps with 60k Armenian overprints. [At Katarsky Zavod the local 1 r 20 overprint on 1 kopeck would have also served]. This reasoning leaves some puzzles in relation to the stamps shown above which include a 2 kopeck and 3 kopeck imperforate with unframed Z. 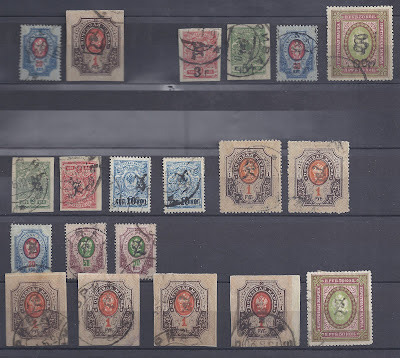 These stamps could have been soaked from philatelic covers, like those sent by Souren Serebrakian to his brother in Tiflis. These are normally correctly franked, but with a variety of low value adhesives. 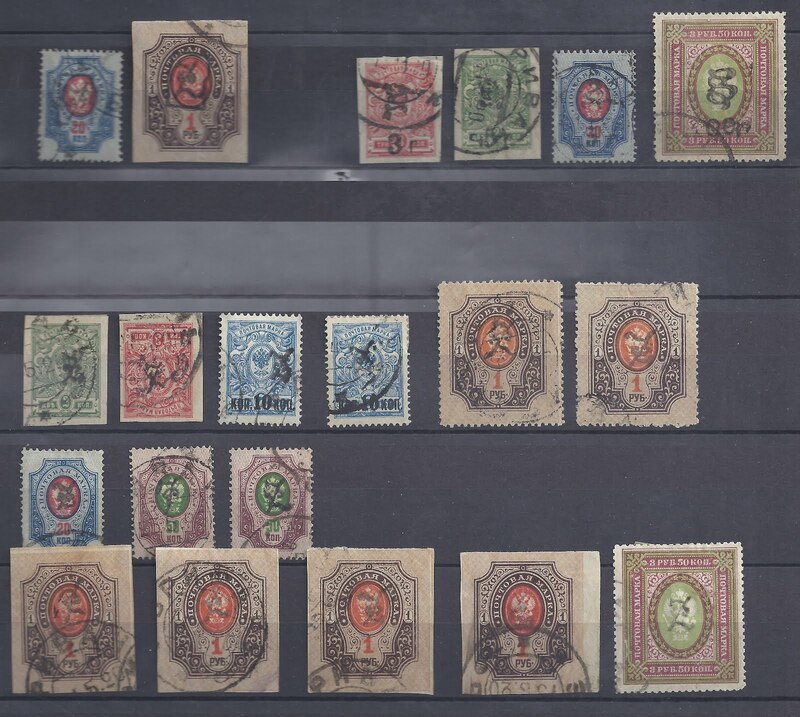 I also have some doubts about the 3r on 3 kopeck and 5r on 2 kopeck imperforate shown in the top row on the right. These have ERIVAN "k" cancellations which are associated with the speculative activity of Paul Melik - Pacher / Pachaev / Pachaian about which I have Blogged before. It's possible that these two stamps are also soaked from philatelic covers. This perhaps shows that though they exist postally used Dashnak stamps are needles in haystacks or hen's teeth.